About 400 kg per square kilometer: this, according to estimates, is the amount of mostly plastic waste littering European seas. Some of it can be upcycled into high-quality clothing, claimed a Spanish SME, which carried out an EU-funded feasibility study to work out the details. And indeed, such garments are now available in its shops. The Spanish SME Ecoalf puts refuse to good use for the production of high-quality textile products and accessories, by recycling materials such discarded plastic bottles, used tyres, old fishing nets and coffee grounds. In 2015, it carried out an EU-funded research project to explore practical aspects of a planned extension of its activity from dry land out into the deep blue sea. The idea was to produce clothes from marine debris, both to raise awareness of the problem of plastic pollution and as a way to help address the issue. The EU-funded feasibility study, which was conducted as part of the deployment of this initiative named Upcycling The Oceans, produced encouraging results. Its achievements include the production of the first chips and pellets made with polyethylene terephthalate (PET) recovered from the Mediterranean Sea, the researchers note. However, before the sorting and processing of a potentially rich harvest of marine litter can even begin, this briny rubbish has to be retrieved. Ecoalf enlisted the help of fishermen, encouraging them to deposit their plastic catch of the day in containers designed for the purpose. As many as 160 trawlers were involved in the trial conducted as part of the feasibility study. And numbers have continued to grow, explains Irene Díez of the Ecoalf Foundation, which was set up to support the deployment of Upcycling The Oceans. More than 400 boats, in a total of 32 ports, are now contributing to this drive to clean up the marine environment, Díez reports. She adds that the participating fishermen have joined in on a voluntary basis: producing high-end fashion may not necessarily be on their radar, but they are concerned about the state of the seas and its impact on their sector. “People don’t want to eat fish full of plastic,” Díez points out. And they don’t want to wade through litter either. Tourism is another industry that stands to benefit from cleaner seas, and it is the focus area of the Upcycling The Oceans project that Ecoalf was invited to help set up in Thailand. This adaptation of Ecoalf’s project, which is backed by a number of local partners, was initiated by the country’s Ministry of Tourism and Support, Díez explains. For the collection of debris, it enlists the help of scuba divers as well as support from fishermen, and also involves volunteers picking up plastic waste on beaches. All steps of the upcycling process, including the spinning of the yarn and the production of the garments, are to be handled locally. The new project was launched in 2017 and is due to run for three years. Díez hopes that it will be one of many more Upcycling The Oceans projects worldwide. The EU support that Ecoalf netted for its feasibility study was provided by the European Commission’s SME Instrument, which helps high-growth, highly innovative small or medium-sized enterprises with global ambitions – and indeed, says Díez, the concept is intended for export. It is, however, still being refined. 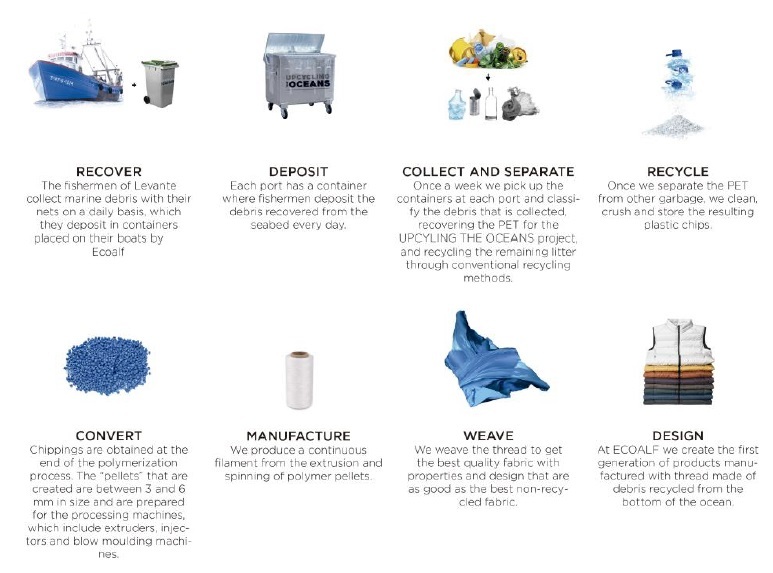 Only 5 to 10 % of the 120 tonnes of debris Ecoalf is collecting annually in Spain is PET, which means that limited amounts of ‘sea yarn’ are produced at the moment, Díez notes. Ecoalf is also looking into ways of upcycling other types of refuse retrieved by its growing fleet of contributors. But the concept works, says Díez: garments produced from marine debris have been available in Ecoalf’s shops since 2016, where the range was first introduced as part of the summer collection. They are equal or superior in quality to similar items made from non-recycled materials, she notes, adding that many customers are surprised when they realise how the textile was produced. Not everyone appears to visualise clothes made from this reclaimed plastic as potentially beautiful, light and soft. In 2017, the Manor Group, an investment fund from Luxembourg, took a 65.9 % share of the company. With this capital injection the company is able to expand outside its home base. It has opened its first shop in Berlin, Germany, and is starting mass production in Thailand. Ecoalf was founded by Javier Goyeneche, its president, who said that the company “arose in 2009 from my frustration with the excessive use of the world’s natural resources and the amount of waste produced by industrialized countries”.